I need some grip heads like the Manfrotte Avenger D200 ( http://www.ebay.de/itm/Manfrotto-Avenger-D200-2-1-2-034-Grip-Head-Alu-Gobohead-Drehkopf-Griphead-Head-Gobo-/271533728709 ) to mount my flags/cutters to my c-stands, but this thing costs about 30 EUR. Does anybody know about some other grip heads that cost less (here in Europe/Germany) or a lot less (to import from Asia/US)? I don't need stepless angle adjustments, so a simpler construction would also do. Any ideas? Plenty of similar plastic (or metal) things are on ebay. Made exactly for your task. @Vitaliy_Kiselvev do you have links or key search words? I did look on ebay, but the only cheap plastic grip heads are way to big (hole diameters are much to big for flags). Didn't find anything else. The metal one does look interesting but with shipping + tax its going to be 30EUR again (and the seller does not ship do Germany anyway). I have tried the plastic ones, but they are much to big - they are not a plastic copy of the metal clamps. Smallest hole diameter is 18mm, but for flags I need 8mm or 10mm. I wish they would make those plastic clamps halfe the size. I have not found any plastic clamps with small holes. As for Weifeng thing. Use the item name - EI 9318 and search local dealers (can even ask). Thanks Vitaliy, will try that. 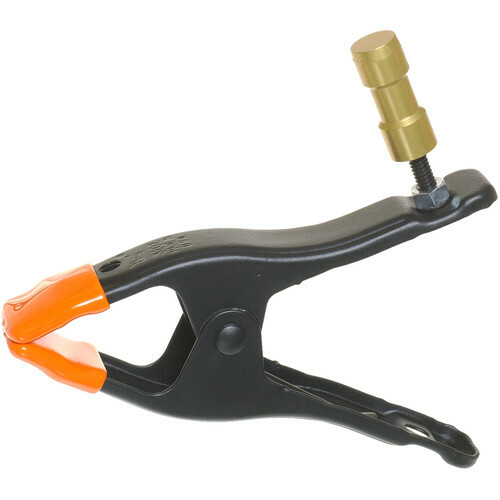 Has anybody found any cheap clamps from a hardware store that will work as double clamps? You can do a fair amount with spring clamps / "A"-clamps. Not on the level of what you can do with a grip head, but clipping stuff to other stuff is pretty useful. You can also bolt a threaded 5/8" baby pin and washer and nut to the handle of a 2" or 3" spring clamp and make a mounting point for lightweight items. Approximately like this: http://www.bhphotovideo.com/images/images500x500/Cool_Lux_MD5250_MD_5250_Original_Spring_Clamp_77902.jpg Spring clamps are MUCH cheaper at the hardware store than at the film photo video store. Re: cheap grip heads- the really cheap ones and the plastic ones will break when you put real muscle into making them stay. Unfortunately I don't think that a super-cheap grip head will serve you well for a long time. A higher priced one will last you essentially forever. Sorry to be the bearer of bad news. @airboxlights Thanks for the info, but I need something similar to a grip head (mounting flags or small LED lights on stands). @dancerchris if I can get a couple of that Impact grip heads for $18 over here in Germany, I would be very happy - but I can ONLY find Manfrotto grip heads for 33 EUR(!). And ordering from the US including shipping and taxes its about the same. Over here you can get most of the things needed for filming at the same price as in the US, except flags and gripheads, they cost at least double the price - as far as I know.